Yesterday we mentioned that if there was a winner of "Julylights" it would be Patrick Kane because of his multiple appearances on the countdown. On the other hand, if there was a loser selected, it would probably be Jakub Voracek, for making three appearances, but being on the wrong side of those highlights. This is a token Kronwall hit. Voracek, coming up the sideboards with his head down, Kronwall stepped up and hit him with his shoulder/back area. The interesting thing is, it seems like Voracek looked up, and you would assume that he saw Kronwall lurking on the blueline. But apparently that wasn't the case, and Voracek payed for it. 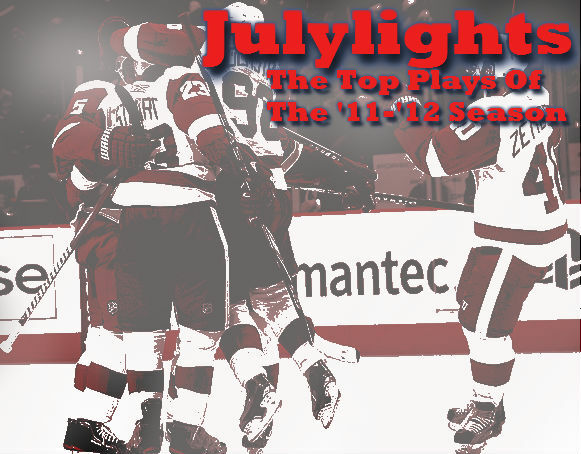 Tomorrow is the final day of "Julylights" and will feature the best goal of the '11-'12 season, so make sure to come back and see this year's highlight countdown off.